Multilevel Inverters: Conventional and Emerging Topologies and Their Control is written with two primary objectives: (a) explanation of fundamentals of multilevel inverters (MLIs) with reference to the general philosophy of power electronics; and (b) enabling the reader to systematically analyze a given topology with the possibility of contributing towards the ongoing evolution of topologies. The authors also present an updated status of current research in the field of MLIs with an emphasis on the evolution of newer topologies. In addition, the work includes a universal control scheme, with which any given topology can be modulated. Extensive qualitative and quantitative evaluations of emerging topologies give researchers and industry professionals suitable solutions for specific applications with a systematic presentation of software-based modeling and simulation, and an exploration of key issues. Topics covered also include power distribution among sources, voltage balancing, optimization switching frequency and asymmetric source configuration. This valuable reference further provides tools to model and simulate conventional and emerging topologies using MATLAB®/Simulink® and discusses execution of experimental set-up using popular interfacing tools. The book includes a Foreword by Dr. Frede Blaabjerg, Fellow IEEE, Professor and VILLUM Investigator, Aalborg University, Denmark. Presents three new topologies. Systematic development of these topologies and subsequent simulation and experimental studies exemplify an approach to the development of newer topologies and verification of their working and experimental verification. Krishna Kumar Gupta is an avid teacher, researcher, consultant and an author. Dr. Gupta is currently serving as an Associate Professor, lecturing on Power Electronics, Control Systems and Circuit Theory. In the year 2015, Dr. Gupta was conferred upon with Young Scientist Award by the Government of Madhya Pradesh, India for his research on inverters. In 2016, he has been awarded by the Confederation of Indian Industries (CII) for his contribution in teaching. Before taking up research on inverters, Dr. Gupta had varying tenures in Bharat Heavy Electricals Limited (BHEL), Tata Consultancy Services (TCS) and National Institute of Technology (NIT) Raipur, India. Post PhD, he was offered a research position at Nanyang Technological University (NTU), Singapore but he was more keen to work on development of technologies for PV based power generation for rural India. Dr. Gupta is a Member, Institute of Electrical and Electronics Engineers (IEEE) and has authored several technical papers. He obtained his B.Tech., M.Tech. and Ph.D. degrees from Maulana Azad National Institute of Technology (MANIT), Bhopal, India. He also serves as an active reviewer for many journals of international repute. Associate Professor, Department of Electrical and Electronics Engineering, Sagar Institute of Science and Technology, Bhopal, India. An entrepreneur, professional engineer, researcher and academician, Pallavee Bhatnagar is a Ph.D. in Power Electronics from Maulana Azad National Institute of Technology (MANIT), Bhopal. Dr. Bhatnagar is currently serving as Principal at Sagar Institute of Science and Technology, Bhopal, India. She concurrently owns and runs a technological enterprise which manufactures electrical equipment. Prior to these, she has worked as an Engineer at National Thermal Power Corporation Limited (NTPC) and All India Radio (AIR). She also works for the social upliftment of women through science and technology and has been honored by the Member of Parliament, Bhopal for the same. Dr. Bhatnagar is a passionate teacher too. Her subjects of special interests are Electrical Machines, Power Electronics and Control Systems. In addition, she is also heading a research on development of efficient power electronics drivers for HBLEDs under the National Perspective Plan (NPP) funded by the Ministry of Power, Government of India through Central Power Research Institute (CPRI), Bangalore, India. Dr. Bhatnagar is a Member, Institute of Electrical and Electronics Engineers (IEEE) and Life Member, Institutions of Engineers India (IEI). She has several research papers to her credit. Concepts are well explained, much easier than reading hell lot of research papers. Great work ! Extremely good and the only one ! Book discusses not just the basics but actually enables one to go to an advanced level. A must have for those working in this field. I've used this book for my research on power electronics. Good book both for fundamentals and advanced learning ! 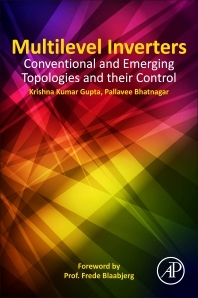 A Great Book for Multilevel Inverters and For Power Electronics too ! This is the ONLY book available which can help you understand multilevel inverters. I have been going thru so many research papers for past many months but reading this book once has cleared my concepts. My university has an elective course too in multilevel inverters and our prof is now referrring to this book. Fundamentals are explained very very clearly. In addition to multilevel inverters, if you are also interested in power electronics in general, you should read this book. You will understand how power electronics work. Simulation of multilevel inverters becomes easy, Simulink models are explained. Control scheme is explained which is topology independent. All topologies in one place and a very detailed comparison. A bit expensive book, but the cost is worth it in terms of contents. Fault tolerance is not fully addressed.